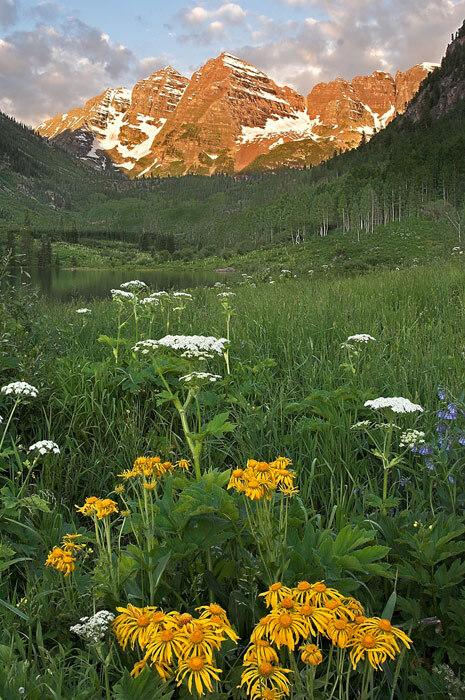 The Maroon Bells Group consists of three peaks above 14,000 feet located near Aspen Colorado. They are so spectacular that people actually pay money to see them. With the jagged peaks reflecting on the shimmering alpine lake, the Maroon Bells are probably Colorado's most recognizable scene. I took this photo in late July when wildflowers fill the valley. Photo © copyright by Mike Barton.